For three years, the Daskal family has wanted to put a South Philadelphia branch of its modern bowling alley North Bowl into the former Colace cold-storage warehouse on Oregon Avenue next to I-95. South Bowl soft-opens Tuesday, Feb. 24. It's a limited operation for now - nighttime during the week, day/night on weekends. 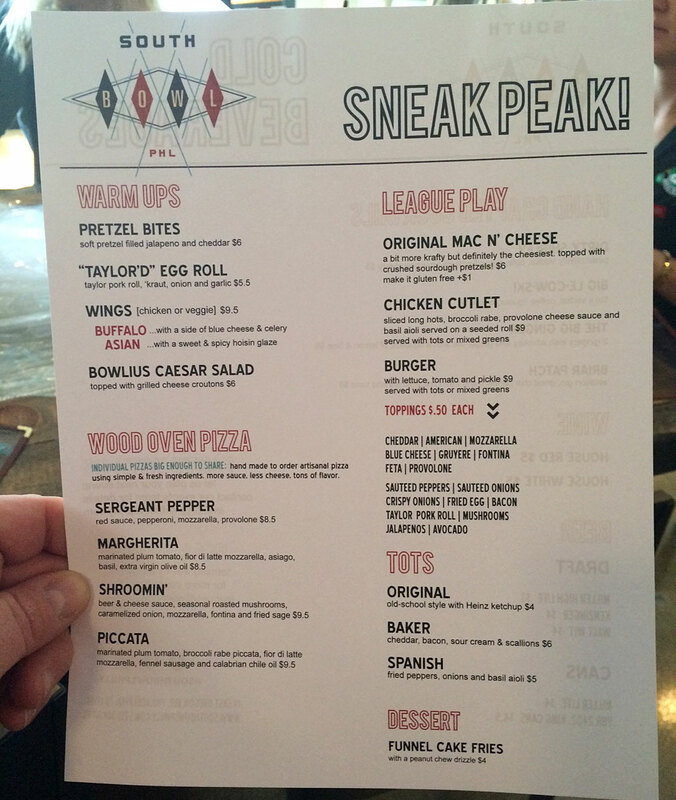 The menu (here), for example, is smaller - with wood-oven pizza, the signature tots, pretzel bites, wings, an eggroll filled with Taylor pork roll, mac and cheese, chicken cutlet sandwich, and a burger. The project was not simply a matter of scooping out a cavernous building and milling some bowling lanes. The family expanded the building, which is on the other side of the I-95 overpass from Tony Luke's - about 150 concrete trucks' worth. It's nearly double the size of North Bowl, which opened in August 2006 in a former auto repair shop in Northern Liberties. You might say it has room to spare. South Bowl has 26 lanes, compared with North Bowl's 17. It will offer league play on its 16 lanes in the main room. An adjacent private space has six lanes, and there's a small four-lane alley upstairs in a private area. Food comes out of oversized kitchen. There is a state-of-the-art AV system, two billiard tables, video games, and cool vintage seating. Oron Daskal scoured the country for the Depression-era curved maple benches. There is 75 linear feet of bar on the main floor. Walls framing two sides of the main bowling alley were cut though concrete. This may be the first time that "Le Corbusier" and "bowling alley" have been typed in the same sentence, but the Daskals say the architect's famed chapel of Notre Dame du Haut in Ronchamp, France, inspired the irregularly shaped window openings. Besides the four-lane alley and bar, the second floor has a balcony overlooking the main alley and a roof deck.